Many home cooks struggle to cook duck breast because they cook it as they would chicken. But not all poultry is created equal, and duck is definitely unlike chicken. 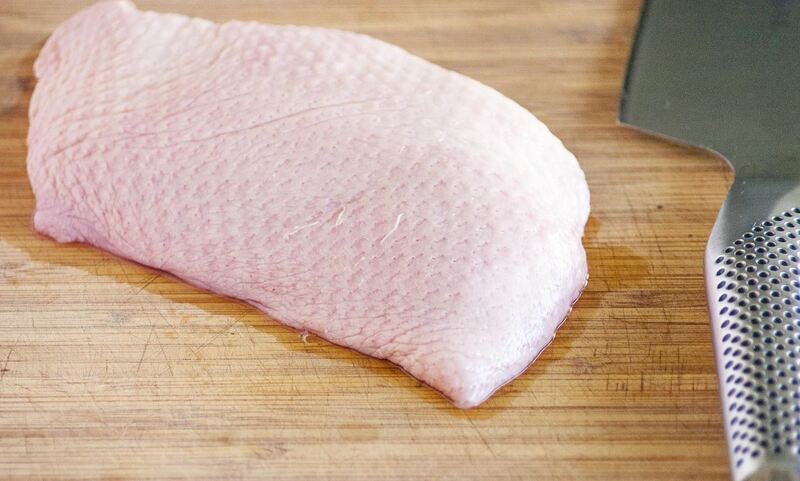 For starters, the breast of the duck is a rich, dark meat, and the cut is covered by a thick slab of fat. 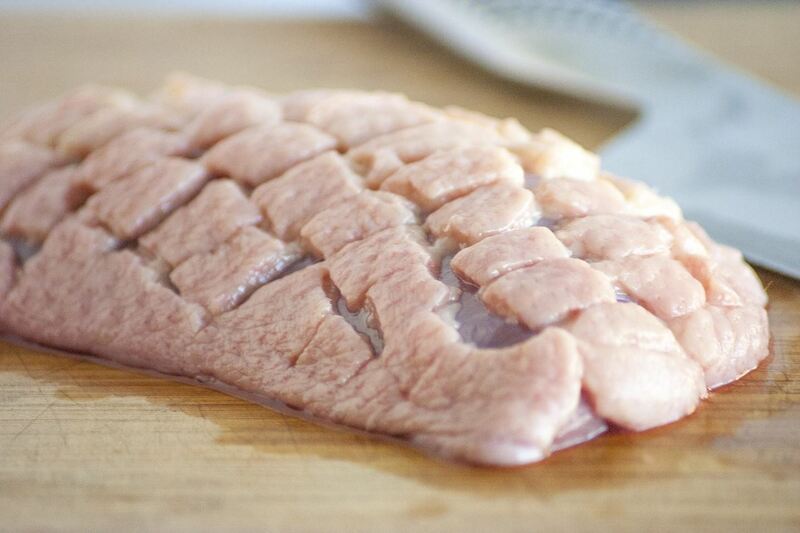 When cooked like a chicken breast, duck meat is dry and chewy, and coated in a half-inch piece of blubber... yuck. When cooked properly, duck breast is juicy, luxurious, topped with crispy skin, and fit to star in fancy restaurants (as it so often does). Master duck breast, and you'll look like a pro in the kitchen; it's the best way to impress your friends or a date. Here are my tips for a perfect, sumptuous duck breast. You can usually pick up duck breast at your local grocery store or butcher's shop precut for you; duck breast can also be ordered online if you don't have any available nearby. First, remove the meat from the packaging and discard any excess juice. Then, pat the meat dry with a paper towel. 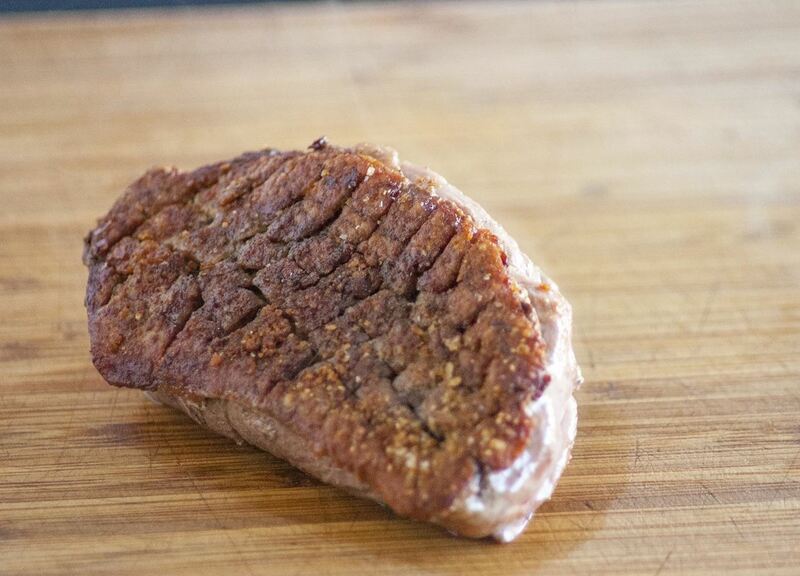 One of the keys to a delicious duck breast is to crisp the fat. Scoring the fat makes it easier for the fat to render and increases the surface area of the fat, which in turn makes for a crispier skin. 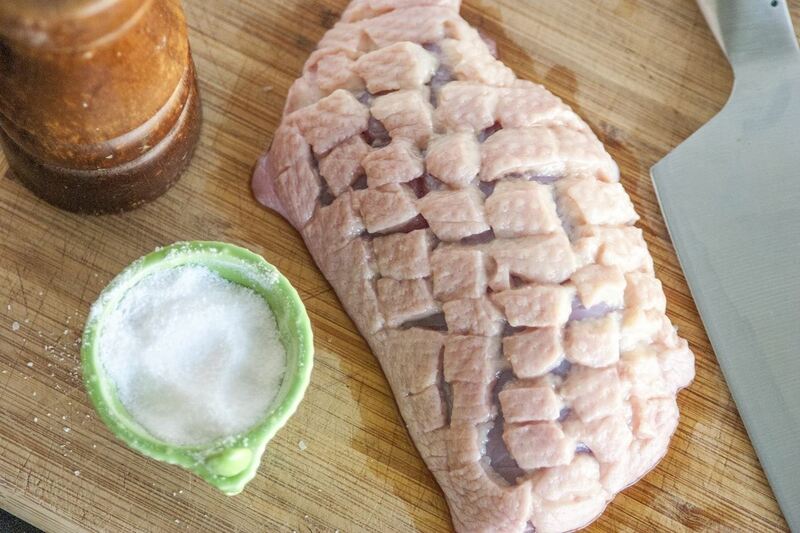 Use a sharp knife to score the fat in a crisscross pattern across the duck; be sure to stop short of cutting the meat. Fat does not absorb seasoning the way meat does, so you want to be extra aggressive when seasoning the duck. Add a liberal amount of kosher salt and fresh ground pepper, making sure to get the seasoning in the scored crevices of the fat. Do not season the other side of the duck. When cooking a chicken breast, you can use high heat with added fat or oil in the pan. 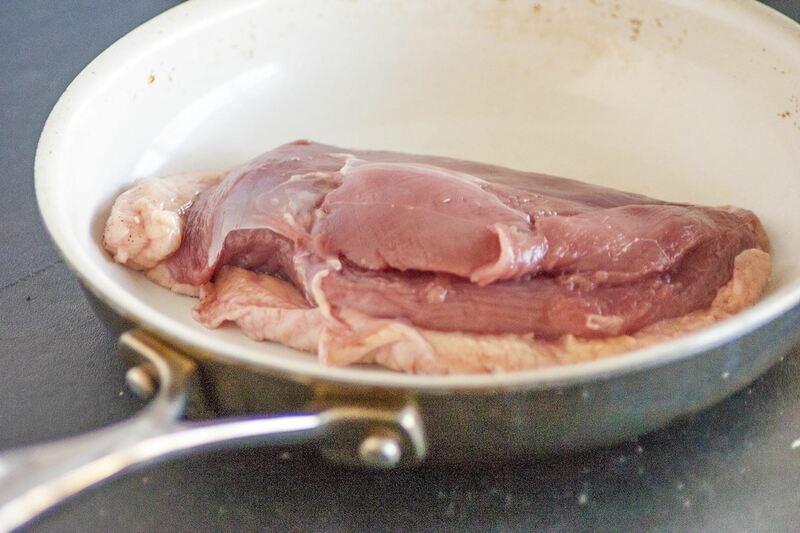 If you do this with duck, however, you will lock in the bird's natural fat—and your finished piece of meat will have a slab of blubbery, unappetizing glob attached to it. Instead, you want to render the fat. 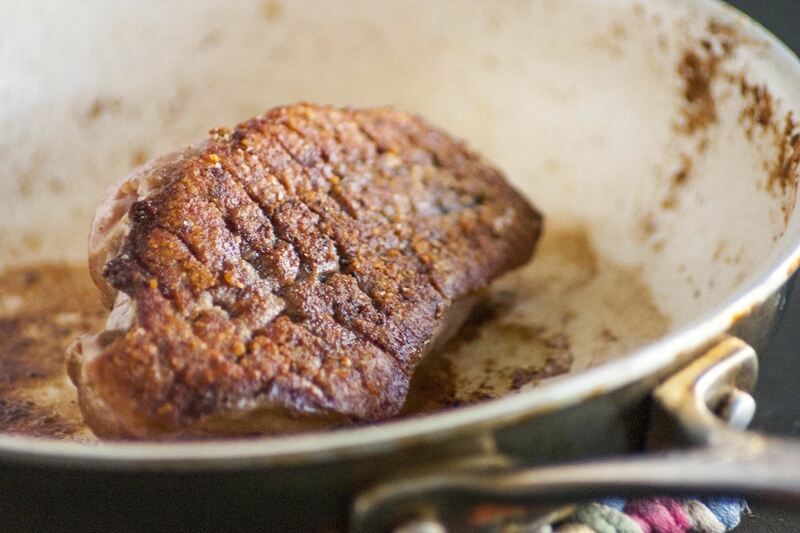 Start by placing the meat fat-side down in a cold pan, and turn the stove to a low setting. Instead of searing the meat and trapping the fat, this allows the fat to melt, and to slowly crisp. The process should take about 12-15 minutes. As the rendered fat builds up, pour it off into a bowl. But don't throw it away! This extra-tasty duck fat can be used to make an amazing pan sauce, golden-fried potatoes, veggies, and more. When the fat has crisped to the point of being a dark gold color, then you can flip the breast. Season the meat lightly with salt and pepper, then use tongs to flip the duck. The meat will only need to cook for about 5-7 minutes after being flipped, depending on how you like it cooked. When the meat has reached the desired internal temperature (130°F for a perfectly juicy piece of meat, or 150°F if you prefer the meat cooked medium), let it rest on a cutting board or plate for 5-10 minutes. If you cut into the meat right away, the natural juices of the meat will spill out and be lost; by letting the meat rest, the juice is reabsorbed, and meat stays tender and juicy. Since duck is a rich, dark meat, you should cut it in thick pieces as you would a steak. Make sure to cut the meat against the grain, with the crispy fat facing up. 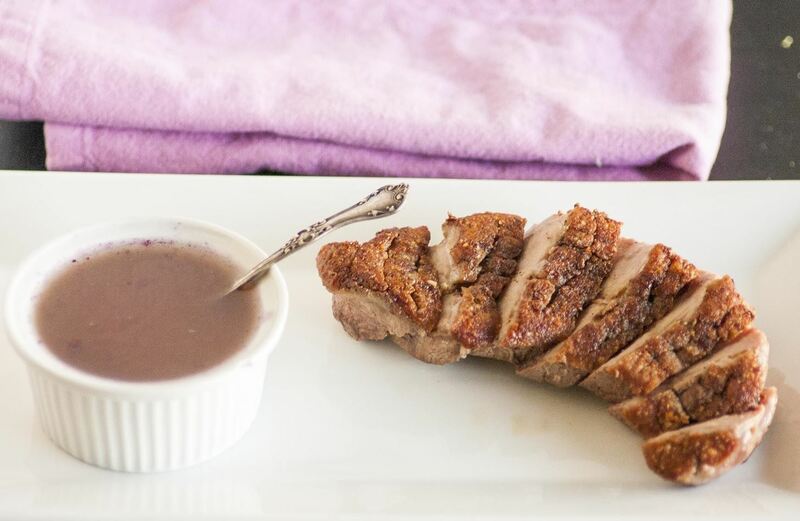 While perfectly-cooked duck breast is perfect on its own, a complimentary sauce is never unwelcome. When I make duck, I always use the fat as the base for a shallot and wine sauce to either pour on top of the duck or serve on the side. That, alongside some roasted potatoes and a big glass of Pinot Noir, is what I call good eats. Duck may be a delicacy, but it doesn't mean that it's not a cinch for you to make at home—especially with these easy steps. Let us know in the comments if you decide to try cooking duck at home... or if you have any tips for our other home cooks!